The two ADVENTURERS agree to a PLAN to reach the CLAY AND AMETHYST SKULL. The CAPTAIN thinks the PLAN is great. The SCHOLAR thinks it is the worst thing since CLOTHING WITHOUT BUCKLES. In order to hold on to the new TREASURE, the CAPTAIN is forced to combine ITEMS within the INVENTORY. The SCHOLAR would like some SODA after his ORDEAL, but he has no VARIOUS MONIES with which to purchase REFRESHING BEVERAGES. Get a JOB and earn some VARIOUS MONIES, ya bums! 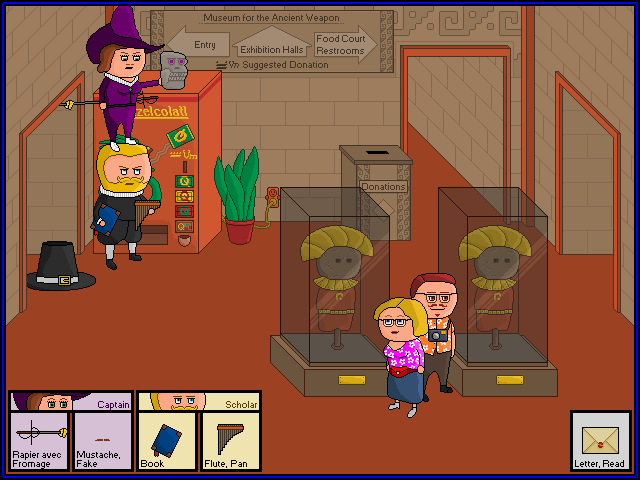 ASK TOURISTS for QUEST with VARIOUS MONEY reward.